This is my final take on Cinque Terre. 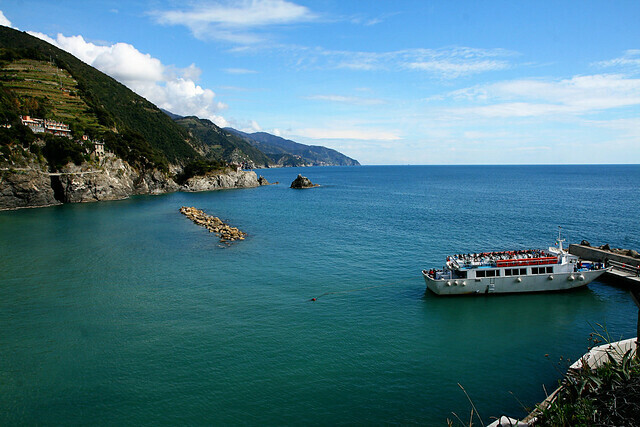 Due to the horrific mudslide and flash flood last October, Vernazza was the worst hit of the 5 and they're still recovering from the catastrophe. 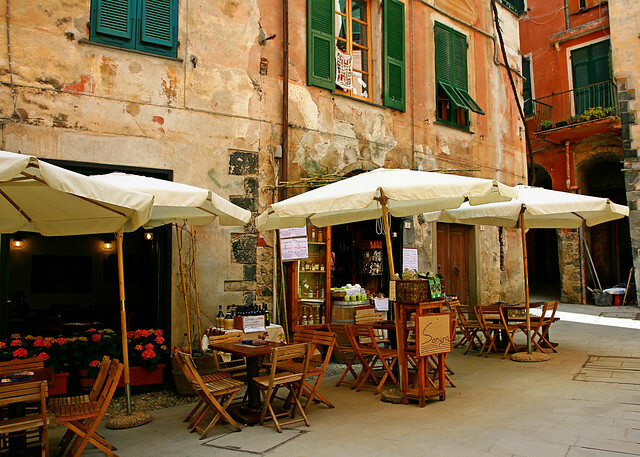 If the state of Monterosso was any indication then Vernazza would be in worse condition. I decided to give Vernazza a miss this time. What a shame because it was such a charming village. Seeing the locals in Monterosso working away like busy bees, I'm sure both places will be back to their former state in a couple of years' time. 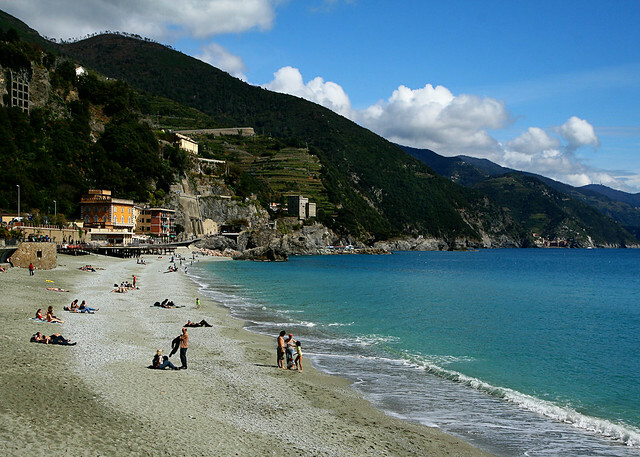 Of the 5 villages, Monterosso has the sandy beach and it's not exactly perched on a hilltop. Hence, the warmer weather and plenty of sun. Lil L is a water rat. She was practically hyperventilating at the sight of the sea. We had to go through the ceremony of touching the sea water and feeling the sand between her fingers. After weeks of badgering me endlessly about taking her to a beach, this managed to earn me a nice respite. I was starting to go a little crazy with the constant "where's the beach?". 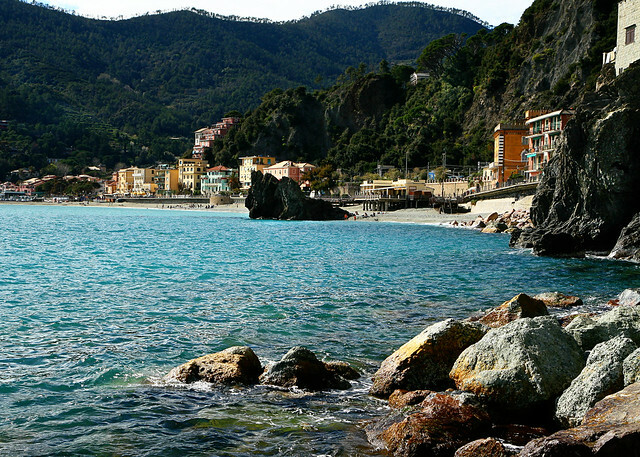 Monterosso is also the most touristy compared to the rest which was also one of the main reasons why I decided on an apartment in Manarola. 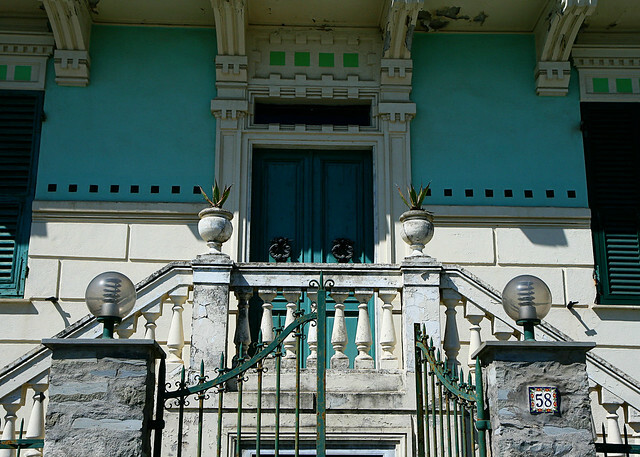 Nonetheless, I found the place rather charming. The locals were still shucking mud from damaged buildings, repainting the walls and reorganizing the shops. There's still so much to be done. The easier coastal walk that connected all 5 villages is currently closed due to the damage caused by the mudslide. 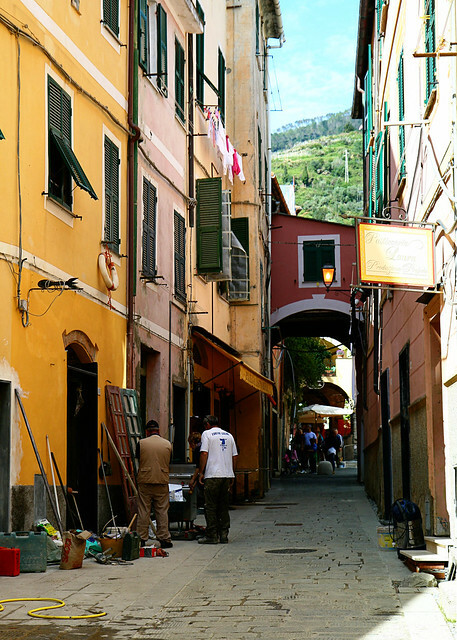 The only walkable trail is the Via dell'Amore that goes between Manarola and Riomaggiore. We unknowingly tried to walk from Manarola to Corniglia, the next town only to find out that the path was unsafe. I was relieved that I had the good sense to read the travel guides before choosing a suitable accommodation. I wouldn't have been thrilled to find out that in order to get from Corniglia train station to the town centre meant that I would've to trek up 366 steps. Okay, so there's a bus every half an hour but heck, I like being minutes walk to the station. I may be a little critical here but after seeing Manarola, Riomaggiore and Monterosso, I was spoiled by the spectacular beauty of these villages. I felt Corniglia was a bit of a let down. None of my shots of Corniglia turned out well either. Bummer. The third picture looks like paradise. Aww - Little L is a beach bum just like me! You are such a talented photographer! Where did you end up staying (which hotel)? I'd love to go one day! Oh god !! I need to spend at least 3 weeks in this place !! The pictures are amazing !! Keep posting !! 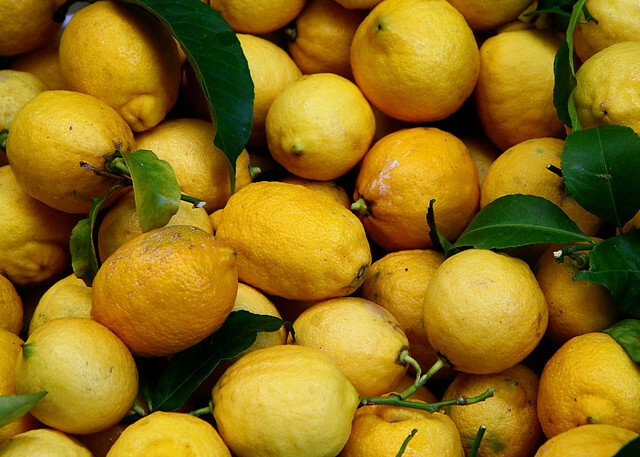 Your photos are simply AMAZING!!!! WOW! It's so picturesque. Worst thing I did was look at your post whilst I was at work! Argh... It's detrimental to one's health who is suffering from cabin fever! These photos are truly beautiful. Thank you for sharing! Your photos are so enchanting. I keep coming back because they're gorgeous. Your pictures are so beautiful, I'm glad you enjoyed your trip in Italy. 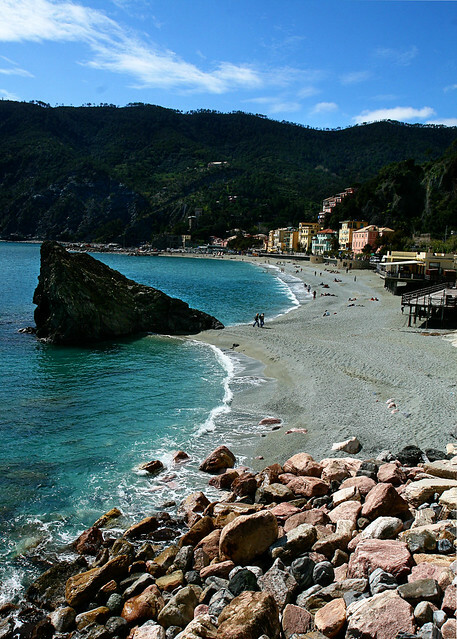 Le Cinque Terre are still recovering, but I'm pretty sure they will be proudly back to their glory in a year or so. I really enjoyed reading about kids being spoiled everywhere you go, people usually say Italy is not a country for kids!